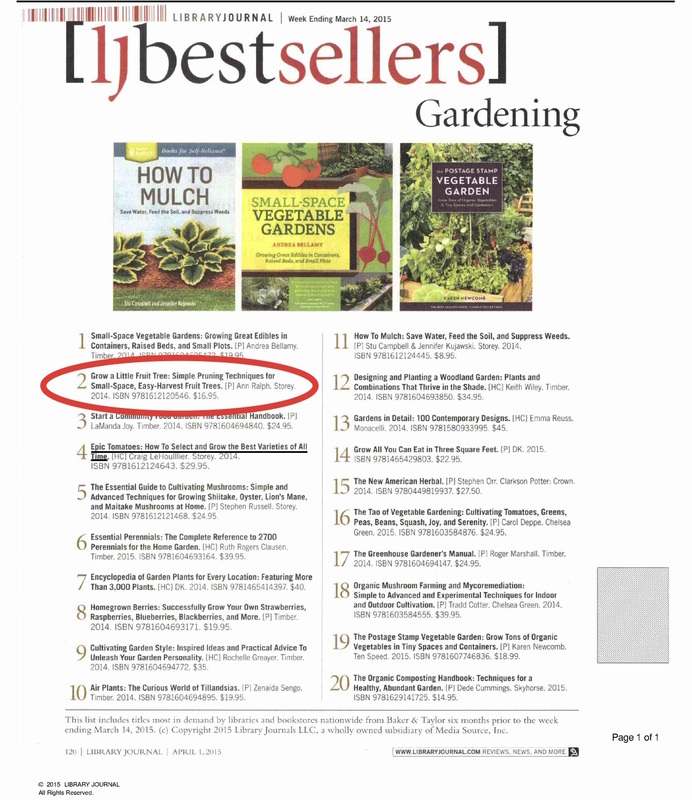 Congratulations to Ann Ralph for her book, Grow a Little Fruit Tree: Pruning Techniques for Small-Space, Easy-Harvest Fruit Trees (Storey Publishing, 2014), appearing on Library Journal’s list of gardening best sellers! We met Ann at a Bay Area Pitchapalooza a couple years ago and helped hook her up with a book deal. Pitchapalooza is the American Idol for books (only without Simon) and it works like this: Anyone with an idea for a book has the chance to pitch it to a panel of judges. But they get only one minute. The Book Doctors, me and Arielle Eckstut, team up with guest industry insiders to form the judging panel. The Judges critique everything from idea to style to potential in the marketplace and much, much more. Whether potential authors pitch themselves, or simply listen to trained professionals critique each presentation, all Pitchapalooza attendees come away with concrete advice on how to improve their pitch as well as a greater understanding of the ins and outs of the publishing industry. At the end of each Pitchapalooza, the judges come together to pick a winner. The winner receives an introduction to an agent or publisher appropriate for their work. Join us for an upcoming Pitchapalooza. We’re pleased to bring Pitchapalooza to the New England SCBWI Conference on April 24, 2015. The Society of Children’s Book Writers and Illustrators is the international professional organization for writers and illustrators of children’s literature. Ann is a fruit tree specialist with twenty years of nursery experience. She teaches pruning classes in the San Francisco Bay Area and lives in the Sierra foothills near Jackson, California. Grow your own apples, plums, cherries, and peaches in even the smallest backyard! Expert pruner Ann Ralph reveals a simple yet revolutionary secret that keeps an ordinary fruit tree much smaller than normal. These great little trees take up less space, require less care, offer easy harvest, and make a fruitful addition to any home landscape. Think Elements of Style for fruit trees. Learn more about Grow a Little Fruit Tree and buy a copy here.